The system Administrator should have contacted you with your logon credentials. You have two login “Names”. The first is your full UVA email address (md5t@virginia.edu). The other is your UVA Computing ID (md5t). Both access the same account. The difference is that you cannot use the Resource Scheduler email features if you login using your Computing ID. 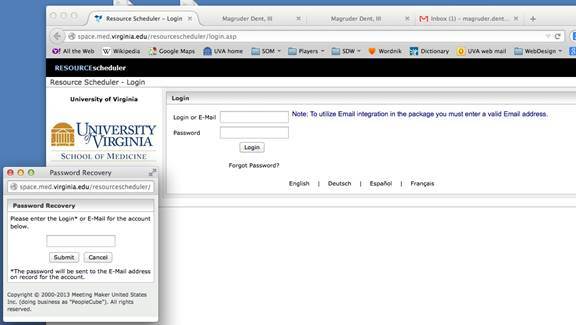 If you plan to send out emails through Resource Scheduler (send a confirmation email) you must login using your UVA email address. If you need to change your logon password, click on the Forgot Password? Link on the Login page. This opens a new window. Enter your login name or full email address. Click Submit. The password will be emailed to the address on the account. Your Home Screen will probably look different on the left hand side, depending on the resources to which you have access. 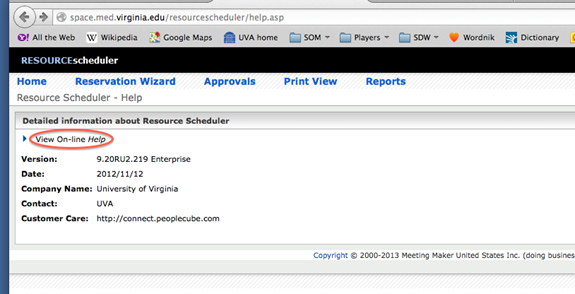 All resources you may access are listed under University of Virginia. Once logged in to the system, you may want to change your password, especially if this is your first time in RS. To change your password, on the Home Screen, click on your name in the upper right-hand corner of the main screen. This opens a window called Personal Information. In this window you can make changes to your account. This is where you change your password, phone number, etc. On this screen, click on View On-line Help. 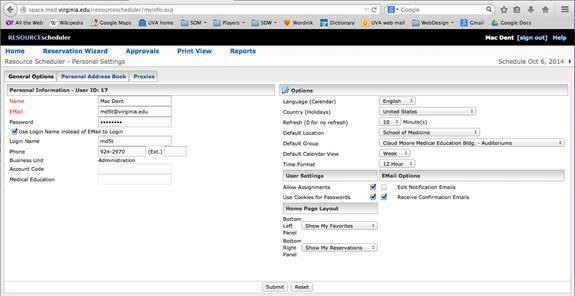 This opens a new window where the user can access all on-line help from Resources Scheduler.